A modern take on ‘The Boy Who Cried Wolf’. 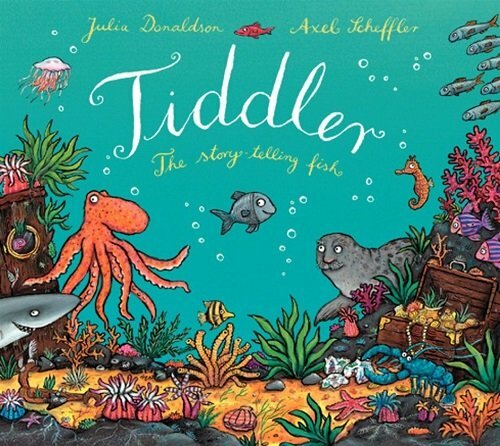 Tiddler is a tiny fish with a big imagination. He is frequently late for class and loves to tell tall tales as excuses. Neither his teacher nor his classmates believe his elaborate stories, but will they believe him when one of his crazy tales actually comes true? Tiddler is written in delightful rhyming text. There is much to discover and describe in the vivid, detailed illustrations. This book is a fantastic choice for teaching children about ocean animals as there is a wide variety illustrated and labelled throughout the book. There are also multiple opportunities to teach the concept of time and days of the week. Children can have a go at reading the time on the clock each time we visit Miss Skate’s classroom during the story. For further speech and language targets in Tiddler, see the list below.